The DCEU understands Batman, even if they don't do it all that well. In Justice League, Ben Affleck’s version of Batman effectively rips off Christopher Nolan’s beloved The Dark Knight by depicting a hero who cares more about preserving the reputation of others than he does his own life. While this vastly improves over the hyper-violent, gun-toting Batfleck from Batman v Superman by adding further complexity to the character, it mostly just feels like a poorly dramatized SparkNotes version of Christian Bale’s now-classic take on the Caped Crusader. Spoilers follow for The Dark Knight, Batman v Superman, and Justice League. To be fair, Justice League understands the nature of Batman’s heroism better than Batman v Superman ever did, which is a welcome step forward for the DCEU that still feels derivative. And that’s because The Dark Knight did it so much better. For Batman, morality means sometimes doing the “bad” thing for the sake of the greater good. Batman’s often called “The Dark Knight” because he stays up really late and instills fear in the hearts of criminals as an antihero. At the end of The Dark Knight, Batman would rather take the blame for all of Two-Face’s murders than let Gotham know that Harvey Dent — the city’s White Knight — turned evil. 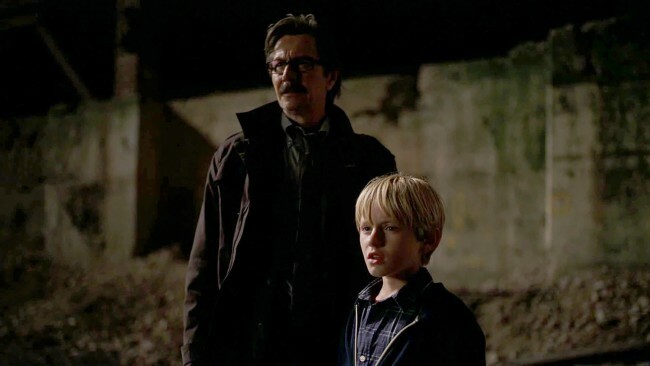 Lt. Gordon with his son in 'The Dark Knight'. One of the few things that Justice League does pretty well is that it renders Ben Affleck’s version of Bruce Wayne more alien than the actual space alien he’s frenemies with: Superman. Clark Kent is a country farm boy who supposedly cares about people and relates to them. Bruce Wayne is a billionaire with zero friends. The Batfleck in 'Justice League'. The Batfleck spends Justice League flying around the world in his private jet chatting with a butler about simpler times fighting villains like Penguin and the Joker. Any problem that Batman can’t solve with brutal hand-to-hand combat, Bruce Wayne solves by throwing money around. He might joke to Barry Allen that his superpower is being “rich,” but it’s exactly that facet of his character that completely alienates him from the world he’s protecting. When Bruce is injured, getting a bit drunk and nursing his wounds up in Justice League, he comments to Diana that he’d gladly trade his life for Superman’s if that’s what it took. Bruce Wayne’s self-loathing defines who he is as a hero. Superman’s value, beyond being uber powerful, lies in how much he inspires hope in people. Superpowers aside, Batman knows that Superman is worth so much more to the world than he is, which is why he’s perfectly fine throwing ethics out the window to get the Kryptonian resurrected halfway through the movie. These two heroes couldn't be more different. In much the same way that Bale’s Batman took the blame for Dent’s actions, Affleck’s Batman says he’s willing to offer up a similar sacrifice. In both cases, Batman’s duty is to protect hope rather than inspire it. We love The Dark Knight because it dramatizes the sentiment so well, but in Justice League it’s just a thing that Ben Affleck says at one point. This throwaway line actually highlights writing problems in the DCEU. The words of heroes, rather than their actions, are at the focus of these stories. In The Dark Knight, Bale’s Batman silently takes the blame and Gordan gives the big speech. In Justice League, Batman gives all the speeches, doesn’t do much in the final battle, and renders himself de facto leader by drawing up plans to turn the decaying Wayne Manor into the new League headquarters. Money, as it turns out, really is his only superpower. Justice League is currently in theaters.